Having the multiple workflows feature in your arsenal you can design any board that you can think of. The multilayer board structure supports team members in their individual and cooperative work and gives ground for process refinement and improvement. How to create Multiple Workflows? Step 1: Open an existing board or create a new Board. Step 2: Activate the edit workflow mode of the board from the "Edit Workflow" icon on the top left side of the screen. 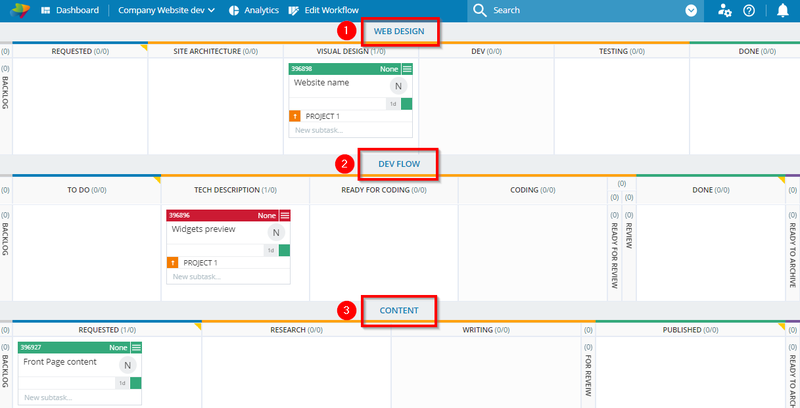 Step 3: Click the "Create New Cards Workflow" button and set up the flow phases using the Workflow designer. Each workflow has a separate Configure Cycle time option on the most right-hand side. Here you can configure which columns should be taken into account to calculate the final cycle time of the cards. Users with the relevant permissions also have the options to Delete or Disable the workflow. Different classes of service in a project are most likely to have different workflows. Usually, tasks in a project are classified by business impact, urgency, complexity, priority. Each class of work has a specific execution policy that the team agrees to follow. Examples of classes of service where Multiple workflows are particularly useful with are “expedite” and “standard”. The typical example of setting a multilayer structure is that the "business as usual" tasks go through the established project process flow, while expedite cards pass through a simpler process (img.1). Each workflow has its own WiP limit as well as different cycle time configuration. *Open the image in a new tab for a better view. This scenario covers the case when different team members follow completely different work processes. Such a setup will allow you to visualize the progress of tasks and to quickly follow dependencies across team members. For example, you might have a marketing team with a content writer, designer and a web developer. A common goal could be adding new website content and functionality. The tasks distributed across team members would include website design (1); functionality development and deployment (2) and text content (3). In this case, each team member would follow an entirely different process to complete their respective tasks.